NOTE: THIS IS THE VERY FIRST AGDC POST NOT FULLY WORD WRITTEN BY MADELINE. GIVE A HAND CLAP TO LEANNA, WHO ANSWERED THE QUESTIONS AS HER DOLLS! Hi everyone! Wow, two posts in one day! Anyway, you know Leanna, a very frequent, awesome commenter and fan of AGDC. The other day I got to chat with her two dolls. I thought it would be nice to have an interview with them. Enjoy! 1. AmericanGirlDollCentral: What are your names? 2.AmericanGirlDollCentral: If you could meet a “star” from AGDC, who would you want to meet? 3. AGDC: What do you wan to be when you grow up? 4. AGDC: Tell us something about the each of you. Ana: I love all kinds of sports. But my favorite are ice-skating and soccer. Kristy: I’d like to travel all around the world. Maybe someday I CAN…. 5. AGDC: If you could have another sister (doll), who would it be? A historical? A Bitty Baby? A Just Like You, maybe? Ana: Kirsten We almost look alike. Kristy: Bitty Twins. They look so cute and it would be fun to have little brothers and sisters. 6. AGDC: What would you day if you wanted to introduce yourself to a new girl at doll school? Ana: Hi, my name is Ana, What’s yours? Kristy: Hi, I’m Kristy. Do you want to talk? Both girls said they also would have a big smile on their face. 7. AmericanGirlDollCentral: You’ve just one a dream vacation for dolls to an awesome place. Also, to make matters BETTER, you get to take TWO friends along with you. Where are you going and who’s coming with you? Ana: I would go to Hawaii and bring Jess(girl of the year 2006) and Kristy, my sister. Kristy: Hmmm….that’s a hard pick…. 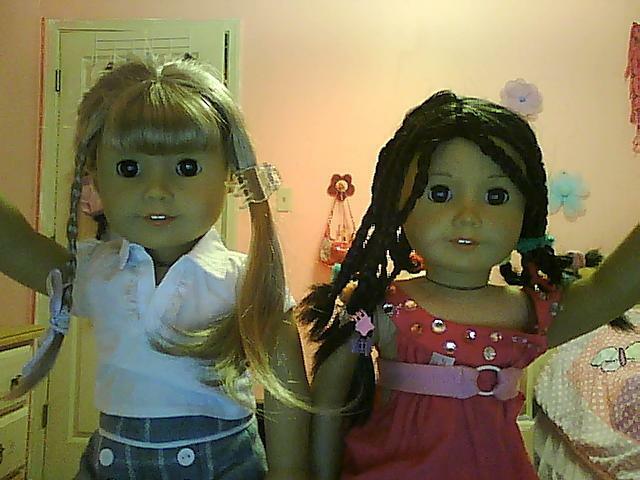 I say American Girl place Chicago and I would take Samantha and Nellie (the historical dolls). 8. AGDC: If you could be a human for a day, what would you do and why? Ana: I would go on a place, because when your 18″ inches high, it’s pretty scary, but if your a human, it’s not so bad. It’s actually pretty fun. Kristy: I would go to the park and go on the swings and see how it feels to swing really, really high. 9. AGDC: What next photo story would you want to see posted on American Girl Doll Central? Kristy: Anything with lots of pictures and dolls in it! 10. AGDC: What is your most favorite thing in the world? Ana: My hair scrunchie. It helps me keep my hair out of the way when I’m working. Kristy: My pet kitten, Smoky, because she cheers me up when I’m sad. Hey! Have you seen that other blogs are doing quizzes and surveys to themselves or their dolls? I made my own quiz and my doll Eva Grace took it. Hope you like it!!! American Girl Doll Central: How would you, Eva Grace, introduce yourself to someone new? AGDC: Director or Movie Star? Eva Grace: Movie Star!!!! But I bet my sister Kit could write an awesome script! AGDC: Ice cream and cake or cookies and baked goods? Eva Grace: Ice cream and cake-y cake! AGDC: If your friend had really hurt feelings, what would you do? Eva: I would try and help her and try to do something entertaining or funny to get her mind off it. I’d really want to help my friend. AGDC: Say you auditioned for a movie and got the part! On the same day as the premiere is your best friend’s birthday party!!! What do you do? Eva Grace: I’d invite my friend to have her birthday party at the premiere! What else do you do??? AGCD: If you had to pick a new name, what would it be? Eva Grace: Isabella Elizabetha LeGrace! AGDC: You are just going out to the mall with your friends, what do you wear? Eva Grace Ward: I would wear something casual, like a simple dress but not to fancy, with leggings. Shoes would be like flats or something. Thank you for looking at my interview for Eva Grace! COMMENT AND RATE!